Honey Ryder: Who is that? James Bond: It's all right. I'm not supposed to be here, either. I take it you're not. Are you alone? Honey Ryder: What are you doing here? Looking for shells? Honey Ryder: Stay where you are. James Bond: I promise I won't steal your shells. Honey Ryder: I promise you you won't, either. Stay where you are! James Bond: I can assure you, my intentions are strictly honourable. James Bond: What's your name? Honey Ryder: Honey... Ryder. What's so funny about it? James Bond: Nothing. It's a very pretty name. Honey Ryder: What's your name? 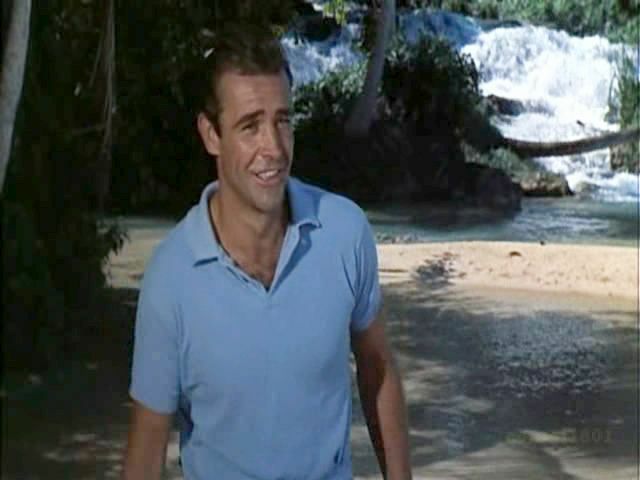 Dr. No picture from 1962 movie Honey Ryder: What do you know about animals? Did you ever see a mongoose dance? A scorpion with sunstroke sting itself to death? Or a praying mantis eat her husband after making love?